About - Why Jewellery ? Following meetings in Hong Kong in 2014 Dr Ching Sze Yin, Cicy, lecturer of Jewellery at Academy of Visual Arts, Hong Kong Baptist University, and Dr Elizabeth Shaw Senior Lecturer and Convenor of Jewellery and Small Objects at Queensland College of Art Griffith University decided to develop an exhibition to show at both of our institutions. We identified similarities between our studios and approaches and were keen to develop a dialogue between our students and graduates and saw the 2015 exhibition as a way to do that. The people invited to exhibit were asked to respond to the question "Why Jewellery? Meaning, why do you make it? Why is it the focus of your arts practice?" 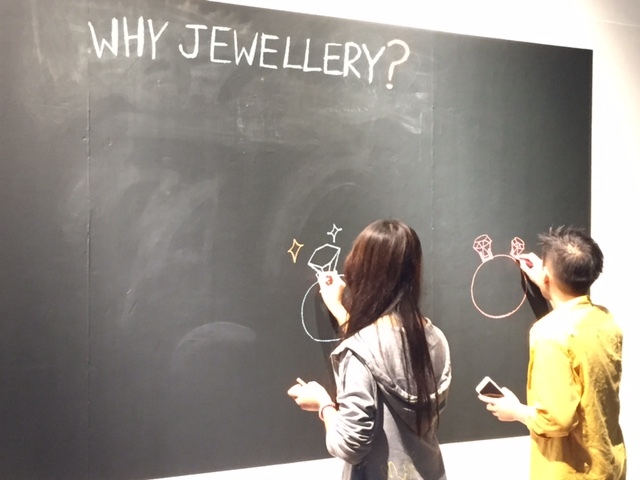 The first Why Jewellery exhibition opened at HKBU in the Koo Ming Kown Exhibition Gallery Hong Kong in May 2015. It then toured to the Webb Gallery at Queensland College of Art Griffith University later that year. Why Jewellery features selected works from current BFA students and recent graduates (up to three years out from Queensland College of Art Griffith University and Hong Kong Baptist University). In 2017 the second exhibition in the series opened in Brisbane in June before touring to Hong Kong. Cicy and Elizabeth also exhibited current research from their own practices. In 2019 the third exhibition in the series will open in Brisbane in May before touring to Hong Kong in September. Humans have long adorned themselves with jewellery, even before written record. During this long history, jewellery has come to represent specific meanings, functions, and to be associated with certain values. We use jewellery to cultivate good luck, avoid disasters, establish identity, build comradeship, show off wealth, display power, express love, memory and other feelings, and also to proclaim our or a society’s social and aesthetic values. Of course jewellery can also be considered a pure fashion statement which is a proclamation in itself. The development of jewellery differs amongst different eras, regions, cultures, geographic environments and technology progressions. There is always a common thread though, and that is to suit the needs of the time, the community, and the individual. Through the interaction of wearer, surroundings, and jewellery pieces, we learn how to express ourselves through adornment. Contemporary jewellery artists take this dialog a step forward. They often use jewellery as the medium for discussing issues that they care about, or use traditional values associated with jewellery for articulating their personal views and opinions. Participants of this exhibition are students, graduates and teachers from the Academy of Visual Arts, the Hong Kong Baptist University and Queensland College of Art, Griffith University, Australia. They strive to create jewellery pieces from topics that are dear to their hearts. Through the interaction of works from two different cultures, we hope to illustrate the possibilities of contemporary jewellery, and its versatility in discussing contemporary issues.